﻿ Seat Belt Safety Tips & Statistics: How Do Seatbelts Work? In an era of super-high-tech safety technology, the most important element of car safety is super-low-tech. It’s not the backup camera or the automatic braking that works hardest to keep you safe; it’s the seat belt. There are plenty of seat belt statistics that show that these upcoming seat belt safety tips work in keeping people safe. When a car crashes or stops suddenly, a seat belt prevents you from traveling forward at the speed the car was going. Instead, the belt distributes stopping force across your body and causes you to slow down — a “controlled deceleration,” if you want to get fancy. How does that happen? And why is it so important to wear a seat belt? We break down all the seat belt facts you need to know. The three-point seat belt as we know it today was invented in 1959 by Volvo engineer Nils Bohlin. 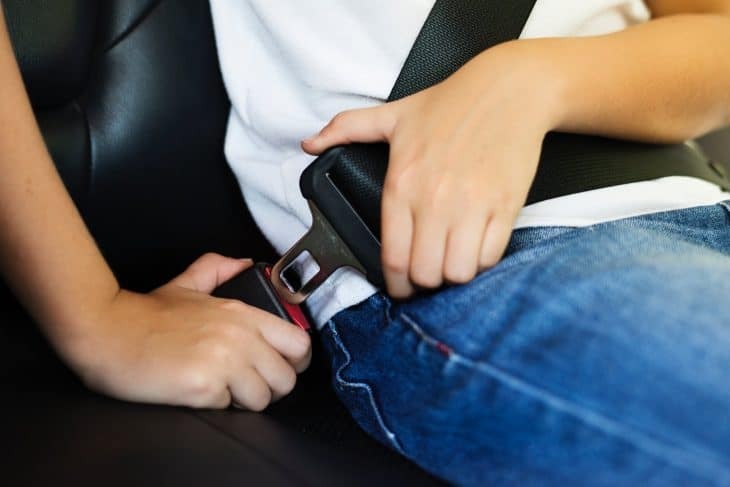 “Bohlin, a former aviation engineer at Saab who worked on airplane catapult seats, knew an effective belt must absorb force across the pelvis and chest yet be so easy to use even a child could buckle up,” Wired reported. Hence the simple, pull-out design. One of the most important parts of a seat belt is a part you don’t see: the locking mechanism which prevents the belt from slipping in a crash. Some systems have a weighted pendulum that swings forward, and others have a lever that’s activated by centrifugal force. Either way, the system puts the brakes on the seatbelt spool to lock it in place. In the 1970s, automakers began to introduce the seat belt reminder system: a flashing light and buzzer that went off when the driver failed to fasten the seat belt. A more recent update to seat belt safety is Mercedes-Benz’s Pre-Safe system, which automatically tightens belts when the car senses a crash may be imminent. More than half of teens (13-19 years) and adults aged 20-44 years who died in crashes in 2016 were not wearing their seat belts. Seat belts saved almost 15,000 lives in 2016. 90.1 percent of Americans wear seat belts. Seat belt use is lower among pickup truck drivers; just 80.8 percent wear them. Young adults (age 18-24) are less likely to wear seat belts than older drivers. We pulled seat belt statistics from NHTSA and CDC. Why doesn’t everyone wear seat belts? While seat belt use is rising — thanks in part to not wearing your seat belt being a misdemeanor in 49 states — nearly 10 percent of American drivers still don’t use them. Specifically, men, younger drivers and people who live in rural areas are less likely to wear them. If you look at the seat belt statistics, they say pretty clearly that if you don’t buckle up, you’re a lot more likely to be seriously injured or die. So why wouldn’t you wear one? Everyone has their reasons, of course. Common explanations include disliking the feeling of a belt across the chest; thinking (wrongly) that passengers don’t need to wear them; thinking (wrongly, again) that airbags will keep them safe; and believing that they drive better without the security a belt offers. These are all fallacies — again, the numbers don’t lie. But what about the big fear a lot of people have: getting trapped in the car after a crash? TrueMotion Family – this free app is unique as it provides a trip score for your driving every time your behind the wheel. It can help you determine how often you drive distracted, if your speeding too frequently, or if your accelarting or braking too harshly. This app can be shared beteween your family members or friends and you can see who is the best driver or most improved driver of your group. Flo Driving Insights – this free app tracks your driving and gives you instant feedback. Like TrueMotion, Flo gives you an overall driving score which you can use to determine how to be a better and safer driver. “Driving Mode” Cell phone apps – Many cell phone providers currently offer driving mode apps or settings on cellphones. Usually some of these apps or settings are free and some can cost a small montly subscription for extra tracking or safety features. These apps or settings can usually block your phone from calls or texts after reaching a certain speed limit and can even reply automatically if needed. Now that you are more aware of safety driving tips, do yourself another favor and compare car insurance quotes. It only takes a few minutes to discover the best deals on insurance and pick the one that’s right for you.